Get a recap of news from Arizona's win over Washington. PJC and Trier have shot a combined 6 for 7 from beyond the arc tonight. That's quite impressive. Markkenen as good as he is has absolutely no toughness. Then again Az has never been known for toughness. At the media timeout, Arizona leads 51-48 with 15:40 left to play. Trier is 3 for 4 from 3-point range tonight. Nuce UofA cheering section there! Love the cheers! Lauri officially has a double-double. Trier is the second Wildcat in double figures. He's got 11. Man I hope Ayton brings some toughness to the center position. Markkanen now has 20 points and nine rebounds. Wow. Just wow. Other than Gonzaga, what top 10 team is dominating? Certainly not Kansas, Baylor or Villanova. Back underway for the second half. Arizona's lack of depth could really hurt them tonight. Do they really look like #5? Why has Arizona recently not played like a 23-3 team? Especially like they have in the past 2 games. Last great game was UCLA. 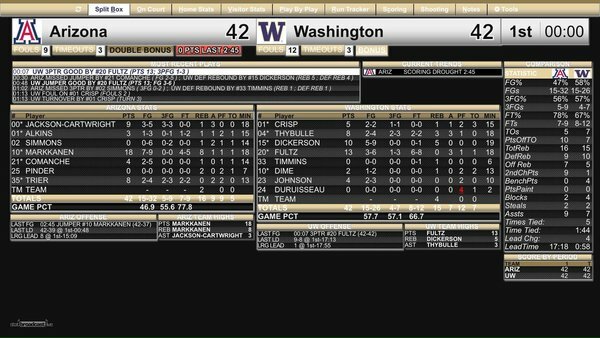 FUN FACT: Washington was actually beating Arizona by two points at halftime when they played each other at McKale Center in January. Just sayin'. Simmons is playing horrible and very lazy this half. Didn't even raise his arms on that inbound by Washington. Why Miller isn't riding that pre Madonna is beyond me? Where has this UW team been? They are playing like UCLA tonight. They had too much talent to be a two win team. Arizona hasn't scored any points in 2 minutes 17 seconds. Why are they eating the clock? Move the ball and tire them out. Washington hasn't hit a field goal in 2 minutes 30 seconds. Replace Fultz with any of AZ freshmen and they would having the same type of scoring volume. I think PJC reacts well to playing time. Arizona leads 42-37 with 2:36 left in the half. Remember when Markkanen and PJC were slumping? Couldn't hit a bucket? Move on. Nothing to see here. Closer to a trey for Markkanen. Maybe next one will be a 3! Another quick bucket from Markkanen gives Arizona a 42-37 lead. PJC with another trey! He's on absolute fire of late. We live in ABQ and would love to listen to Brian Jeffries (over Bill Walton). Is the audio streamig online? Markkanen, of course, leads Arizona in scoring with 16 points. Next is Trier with eight points.